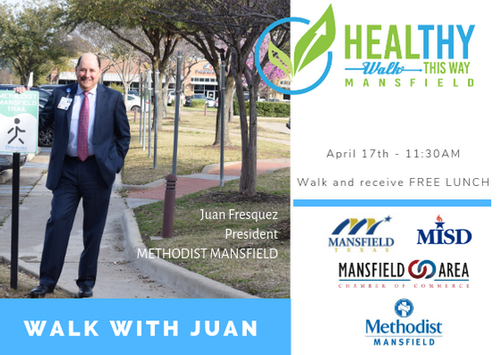 Meet Juan Fresquez, president of Methodist Mansfield, and step out for health on April 17 at 11:30 a.m. at the Women’s Center entrance for a one mile walk and meet and greet with community members, including representatives from the City of Mansfield, Mansfield ISD, and Mansfield Area Chamber of Commerce. Juan will share ways on how to improve your health followed by a complimentary salad, bottled water and door prizes. The one mile fun walk begins at 11:30 at the Women’s Center entrance and is part of the “Walk This Way” city’s initiative to improve the health of the community. Research shows walking may help you think better, feel better, and sleep better. It may even reduce your risk of serious diseases like: heart disease, stroke, diabetes, depression, insomnia, and several types of cancer. Walking can help improve your blood pressure, blood sugar, and blood cholesterol levels, as well as, your mental and emotional well-being.